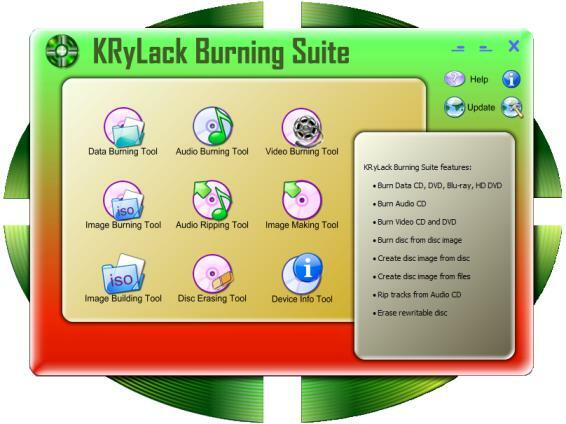 KRyLack Burning Suite is a complete solution for all your CD and DVD burning needs. Features: Burn Data CD, DVD, Blu-Ray, HD DVD in just a few clicks; Easy creation of music CDs and sophisticated multimedia compilations; Create video discs playable on your home DVD player; Extract ("rip") music from your audio CDs; Create disc images from discs or files (can be used for copying discs); Erase rewritable disc; Supports most available burners. Make DVD Video from your Camcorder or DVD Files. Qweas is providing links to KRyLack Burning Suite 1.10.04 as a courtesy, and makes no representations regarding KRyLack Burning Suite or any other applications or any information related thereto. Any questions, complaints or claims regarding this application KRyLack Burning Suite 1.10.04 must be directed to the appropriate software vendor. You may click the publisher link of KRyLack Burning Suite on the top of this page to get more details about the vendor.